Buy through MusicWeb for £14.25/15.70 postage paid World-wide. The name of the Neapolitan composer Giovanni Paisiello has stuck in the history books. This is largely down to the scandalous premiere of Rossini’s Il Barbiere di Siviglia in 1816. Admirers of the aging Paisiello, who died the same year, booed the performance out of displeasure with Rossini’s use of the same story on which Paisiello had based his possibly most successful opera more than twenty years earlier. 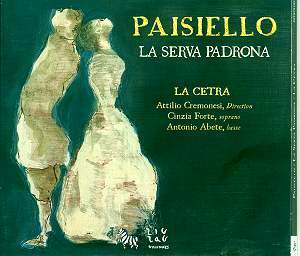 That opera, which is still revived occasionally, certainly has much to recommend it and even though it can’t compete with Rossini’s for melodic invention and spirituality it shows Paisiello as a skilled composer with a fine melodic vein and a flair for surprising ideas. Among Paisiello’s musical numbers there is, for example, a trio for singer, yawner and sneezer. Paisiello was invited to St Petersburg in 1776 by Empress Catherine II and during the eight years he stayed there he wrote both Il barbiere di Siviglia and La serva padrona, in which, ironically enough, he re-used an old libretto, namely the one that Pergolesi had set almost fifty years earlier. This recycling was due to pressure of time and was by no means unique in the operatic world of the time. Many librettos were set by a number of composers and in this case Paisiello made several adjustments, such as adding asides, omitting lines and also restructuring some parts. There are no musical references whatsoever to the Pergolesi work and while Pergolesi employs a string band with harpsichord, Paisiello’s orchestra has double flutes, oboes, clarinets, bassoons and horns added to the strings, which in this recording number twenty. La Cetra play on period instruments and the recitatives are accompanied by a forte piano. Giuliana Retala, the pianist, is allowed to embellish the accompaniments quite extensively – and also quite deliciously. The winds and the fairly large number of strings make it a much grander affair than Pergolesi’s more chamber-like intermezzo. Conductor Attilio Cremonesi pulls out all the stops and goes for knock-out from the beginning. The whole opera is played with a fire and pizzazz that is breath-taking even though this "straight-to-the-point" approach may rob the music of some subtlety. It’s an easy loss to take, considering the vibrant vitality of this performance. According to the booklet it was recorded live, but there is very little audience noise. On the other hand perhaps the presence of an audience inspired the lively and expressive acting and singing. The Uberto, Antonio Abete, sports a flexible and light (as opposed to heavy) but dark (as opposed to light) bass voice. He articulates extremely well and sings with face. Cinzia Forte sings well as Serpina but with less individuality of utterance than Abete. For some reason she sometimes seems to be in a different acoustic from Uberto, as in their first duet (tr. 4) where she is surrounded by a lot of reverberation. This appears again in her aria (tr. 11) which opens act 2. I wonder if this is an acoustic illusion as a result of interference between the high strings and her voice. I reacted the first time and noticed it the second. Even so it does not detract from the enjoyment of the performance. This aria, by the way, has a really catchy tune. Tracks 17 and 18 stand out from the rest of the score, since we are temporarily transported into the world of opera seria – not in real earnest, of course. It is however a departure from the comedy when Uberto in the accompanied recitative and the following aria realises that he may have feelings for the poor girl. ‘Is it love or pity?’ he asks in the aria and the double basses rumble in sympathy, revealing the conflicting feelings deep in his heart. After the intervention of the mute Vespone everything is settled to the contentment of both parties and they sing their hearts out in the lively and happy final duet. Being very familiar with Pergolesi’s little masterpiece, I derived a lot of pleasure from this up-sized version, which is about one third longer. There is a well researched essay in the booklet and the libretto in Italian, French and English. Whether or not one knows Pergolesi’s ‘original’ is of little consequence; this is good entertainment from one of the finest Italian opera composers before Rossini.